Product #60813 | SKU HLX-PMC-V | 0.0 (no ratings yet) Thanks for your rating! This plate takes power management concerns away from the camera, and provide a “hot-swappable” platform between on-board and block battery/AC mains. A deposit of $35.00 is required for this pre-order. 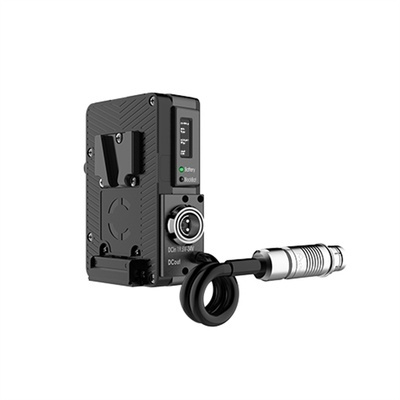 The Core SWX Helix Direct Mount Power Management Control with V-Mount Front for ARRI takes power management concerns away from the camera, and provide a “hot-swappable” platform between on-board and block battery/AC mains while providing transparency to the AC on set. The mount plate system uses a standard 2-pin Fischer connector for the power input on the plates, simplifying the array of cables production companies and rental companies need to inventory while addressing many different camera makes. The HLX-PMC-V mounts directly to ARRI cameras, and has a v-mount front. It also accepts standard V-mount 14v battery packs (not for ARRI LF applications).